With the implementation of the “Belt and Road” initiative, the Guangdong-Hong Kong-Macao Greater Bay Area (Greater Bay Area) has become an important part of China’s national strategy, ushering the Pearl River Delta urban agglomeration into the “Greater Bay Area” era. In this context, the Qianhai Cooperation Zone will demonstrate best practices for deeper cooperation in the Greater Bay Area. A locus for international resources in service of the Chinese mainland with support from Hong Kong and Macau, the zone will feature a unique, forward-looking urban center in the world-renowned bay area, a novel core engine for collaborative innovation in the Greater Bay Area, a demonstrative pilot zone for future urban development, and a strategic pivot for the “Belt and Road” initiative. 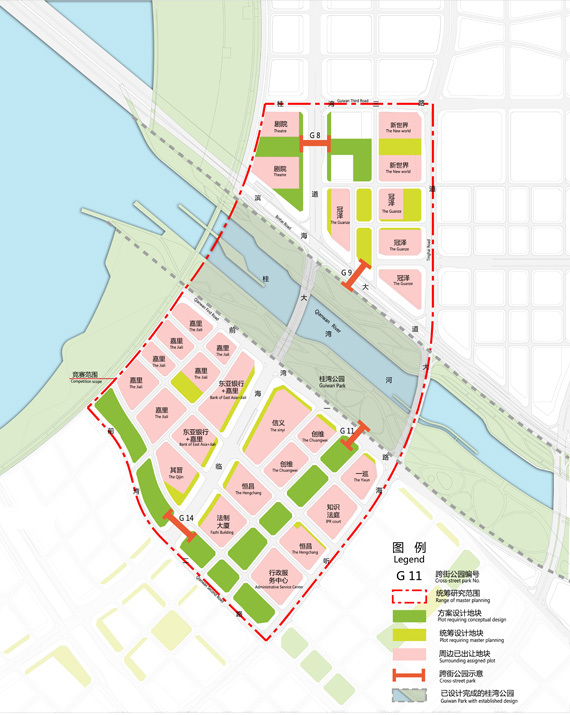 In accordance with Planning of Qianhai New Urban Center, as one of the major innovation nuclei defined in the upper-level plan, Qianhai is well positioned to lead the development of the Greater Bay Area. On the one hand, it will actively coordinate and utilize S&T innovation resources from all around the world to build an internationalized and open regional innovation system and a novel cooperative community for the Greater Bay Area. On the other hand, as one of the dual centers of the city, Qianhai will promote axial coordinated development of urban functions, strengthening the regional service functions of modern service industries while further aggregating urban public service functions to create a new mixed-use urban center. In accordance with the Specialized Planning for Walking and Cycling System of Qianhai Cooperation Zone, 19 cross-street parks , 9 skywalks and 15 sky footpaths are planned in Qianhai. The sky footpath system comprising cross-street parks, skywalks and sky corridors is connected to the pedestrian systems below grade. The goal is to create a humanized “slow-traffic” environment (for pedestrians, pedaled bikes, etc. ), enhance the vitality of the street, develop a sustainable green traffic system and slow-traffic space with Qianhai characteristics. To make Qianhai a unique new urban center of the Greater Bay Area, the Competition will follow a people-oriented design philosophy to create an attractive and pleasant public space system, and in doing so, enhance the well-being of people in order to make Qianhai a more appealing destination. The Competition includes designs on three levels, namely, the overall research and design, conceptual design, and detailed node design. Scope of overall research: The scope of overall research under the Competition includes parts of Development Unit 2, 7 and 9 of Qianhai area, totaling a land area of 710,000 m2 as defined by the red dotted line below. Scope of overall design: the public spaces within the scope of overall design total 29,655 m2 as shown in the yellow-shadowed area below. totaling a land area of 82,232m2, the below-grade and above-grade public buildings totaling a floor area of 23,800m2 as well as four cross-street parks (as shown below). Scope of node design: Participants can select two to three nodes that can fully reflect their design ideas and features within the scope of the Competition and conduct a more detailed node design. The design under the Competition should be detailed to the conceptual level. Based on the existing upper-level planning, participants are required to provide a conceptual design for public spaces, supporting public buildings and cross-street parks within the scope of the Competition, and propose planning and construction indicators for various plots of the public space. The prequalification documents should be submitted in two different formats, namely soft copies to be submitted to Shenzhen Construction Project Exchange Service Net and hard copies to be delivered to the place specified in the Competition Announcement by the deadline. upload required materials by 17:00, Feb. 20, 2019 (China Standard Time). Important Note: The above is a tentative schedule following China Standard Time. The Organizer reserves the right to make changes to the schedule as necessary. Organizer: Shenzhen Qianhai Development & Investment Holding Co., Ltd.
Shenzhen Rijie Ruixin Urban Planning and Design Consulting Co., Ltd.
Shenzhen Jianhengda Cost Engineering Consulting Co., Ltd. Applicants should deliver or courier the above required materials to Rm. 1309, Block B, Gongyuandao Building, 26 Deng Liang Lu, Shenzhen (subject to change) by 17:00, Feb.20,2019 (China Standard Time). Please pay attention to the Official website of Shenzhen Construction Engineering Trade Service Center, Shenzhen Center for Design and WeChat Public Number of Shenzhen Rijie Ruixin Urban Planning and Design Consulting Co., Ltd. and download the relevant competition documents.